Pineapple 44" High Old Stone 3-Tier Outdoor Fountain | Fountain City Art Ctr. 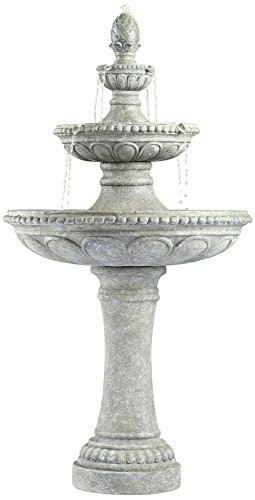 The bowls of this charming old stone finish outdoor fountain are detailed with large floral petal accents and a bead-like, sculpted trim around the edges. Its three-tier design features a large lower bowl, a medium center bowl and a small upper bowl. A classic pineapple finial at the top doubles as the water spout. - 44" high x 23" wide and deep. Weighs 29.75 lbs. - Classic 3-tier outdoor fountain based on vintage Italian designs, by John Timberland. - Old stone finish; fine cast lightweight resin construction. - Includes pump and 9-foot cord; easy set-up. - Three levels of water; pineapple spout accent on top. 44" high x 23" wide and deep. Weighs 29.75 lbs. Classic 3-tier outdoor fountain based on vintage Italian designs, by John Timberland. Old stone finish; fine cast lightweight resin construction. Includes pump and 9-foot cord; easy set-up. Three levels of water; pineapple spout accent on top.